The Shelby G.T. 350H is a very special Shelby as, it was used as a rental race car available through Hertz rental car stores in '66. Featuring the 306 HP 289, it was just as capable as the "regular" G.T. 350 available at Ford dealers. There were 1000 ordered by Hertz, but this is one of 2 that were refused by Hertz and was never used as a rental. Truly a rare and significant example from the Brothers Collection! 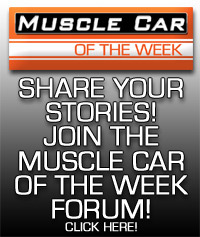 You can guess next week's Muscle Car Of The Week on our Facebook page! Subscribe to our YouTube channel and you will never miss an episode of Muscle Car Of The Week! Ford was "all-in" when it came to NASCAR in 1969, and this 1969 Ford Talladega is the street-going result of their racing and aerodynamics research. These cars featured special sheet metal to improve high-speed aerodynamics, and the results were worth the efforts. Its a 428 Cobra Jet powered ride with a bench seat and column shifter, and it's our Muscle Car Of The Week! A Studebaker, on Muscle Car Of The Week? We think this original and extremely low milage Avanti R2 with the Paxton Supercharged 289 qualifies. What do you think? It's a great car from The Brothers Collection that deserves some recognition.